The century-old company is brewing in Rhode Island once again. Jeremy Duffy is leading a grand tour of Rhode Island’s future beer mecca, Isle Brewers Guild (IBG). The “craft cooperative” — a full-service brewery and taproom and “food and beverage campus” — is a sprawling, multi-building, 130,000-square-foot complex at 461 Main Street in Pawtucket. It’s also the new home of Narragansett Beer, which will make its long-awaited return to being brewed in Rhode Island. There’s a lot to take in during the walk-through at the Guild, as the complex will be known, and the tall, bespectacled Duffy is clearly eager to share the scope of his ambitious venture. He enters an expansive area that bustles with activity. “Six months ago, there would have been ten separate rooms here,” Duffy says. Now the space is being converted into the packaging hall, filled with two brite tanks and multimillion-dollar canning and keg packaging lines from Italy and Belgium. Stepping outside past the loading dock, Duffy points to the long structure that will be the site of a beer hall on the first level and a second floor mezzanine. He then strides into a courtyard that will host beer festivals, plus music, food and arts events. It will be a destination where “people can walk around, have a pint and enjoy the moment,” he says. Then we reach the core of the IBG — the vast brewhouse — where the beer will be produced. “This is a special building,” Duffy marvels. The expanse has gone through a remarkable transformation in the last few weeks. It is filled with sunbeams from skylights that run the length of the ceiling and the newly-installed windows in the wall that face Main Street. The 10,000-square-foot space is being fitted with the first wave of equipment for the 100-barrel, four-vessel brewing system: a giant lauter tun (which processes grain), mash tun and towering fermentation tanks that were custom-built in Oregon. The aroma of beer in the making will soon permeate the air. The Guild’s upper level in the back half of the room is bordered by a mezzanine, which will host beer events. Outside the brewhouse, a foundation has been laid for grain silos that extend above the roofline (the spent grain will be given to local farmers). Duffy notes that when the Guild opens by late-February or early March, a temporary taproom will be located in the brewhouse; the full-fledged, 6,000-square-foot beer hall is slated to open in early 2018. Attractions and business opportunities — and an educational component, to further beer enlightenment and know-how — will be housed in the rest of the campus. “We’re looking at food manufacturing, beverage manufacturing, retail space,” Duffy says. “We want to be associated with as many Rhode Island companies as possible. Since 2011, ten craft breweries have opened in Rhode Isand and three more will open their doors this year. They’ll join the bigger mainstays of Trinity Brewhouse, Union Station Brewery, Coddington, Newport Storm and Mohegan Cafe and Brewery, all of which came along in the ’90s. All of the businesses have expanded their production and many have widened their distribution since entering the market. Local beer makers are also bolstering the state’s coffers; in 2014, craft brewers’ economic impact was $160 million, according to the Brewers Association. And there is about to be much more beer flowing from the state with the opening of IBG, which has plans that go beyond being just a brewery. Isle Brewers Guild was conceived by Duffy, partner of the public relations firm Duffy and Shanley, which worked on the re-launch of Narragansett Beer in 2005 (he left the company in 2013 to focus on IBG), and Devin Kelly, who spent more than ten years with InBev, the Belgium-based brewing behemoth that bought Anheuser-Busch in 2008. He was also a partner at Dynamic Bicycles and former global president at LaserPerformance, a sailboat manufacturer best known for the Sunfish. The number of breweries in the United States grew from eight in 1980 to 537 in 1994; from 1,447 in 2005 to 2,033 in 2011 — and has soared to an all-time United States high of 5,005 (as of November 30), with an average of two new breweries opening daily and more than 2,000 in the planning stages. Duffy notes that the IBG concept takes “a 360-degree approach to the industry,” providing comprehensive production — from brewing to canning and kegging to taproom sales — for companies seeking to boost their supply to meet an ever-increasing demand. “We started talking to brewers, we started talking to investors, we started talking to the state and it snowballed from there,” Kelly says. In March 2015, IBG was on the verge of closing the deal on the first planned home of their venture — at Kinsley and Sims avenues in Providence — when a four-alarm fire ravaged the building. The Guild will augment Pawtucket’s status as the de facto craft beer hub in Rhode Island. It’s the home of Foolproof, Bucket and Crooked Current breweries. And the IBG crew notes that the superb quality of the city’s water supply, which was improved by a treatment facility installed in 2008, will enhance the company’s beermaking. The property, formerly known as the Kellaway Center, was the home of the William Haskell Manufacturing Company, one of the oldest nut-and-bolt factories in the country for more than a century, and was later transformed into a transportation hub. It was purchased for $1.25 million; the total cost of the endeavor is about $12 million. The IBG’s funding came from a combination of loans (including $2.8 million from the United States Small Business Administration and $500,000 from two Pawtucket agencies), bonds ($4 million from the Rhode Island Industrial Facilities Corporation, which is part of the state’s Commerce Corporation), and private equity investors (including Duffy and Kelly). “We’re thrilled that Isle Brewers Guild chose to ‘Join the Evolution’ here in Pawtucket,” Grebien says, citing the city’s forward-thinking slogan. “With a commuter rail stop planned just two blocks away, we expect continued growth that will build on the vision that the IBG is helping develop.” The IBG will employ about twenty workers in its first months of operation. 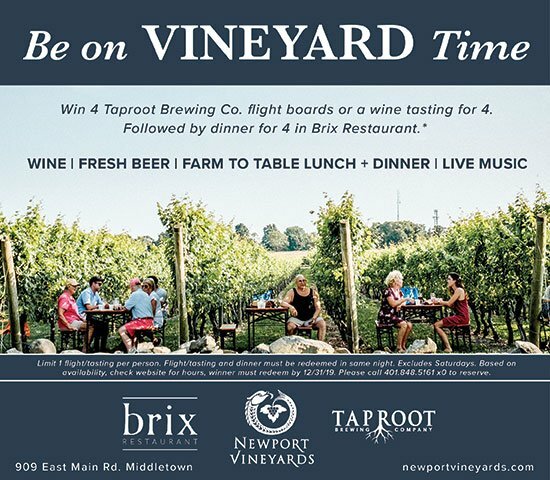 At press time, IBG was waiting to finalize “upwards of four additional relationships”; aside from Narragansett, only one other partner had been officially announced: Newburyport Brewing, which was founded in Massachusetts in 2012 by Chris Webb and Bill Fisher. In the first stage, the IBG has the capacity to brew up to 60,000 barrels of beer a year (equivalent to more than 825,000 cases); the second phase will yield up to 100,000 barrels, and maximum capacity will reach 150,000 barrels. The beer will be packaged in cans — at a rate of 250 twelve-ouncers or 180 sixteen-ouncers per minute — and kegs. 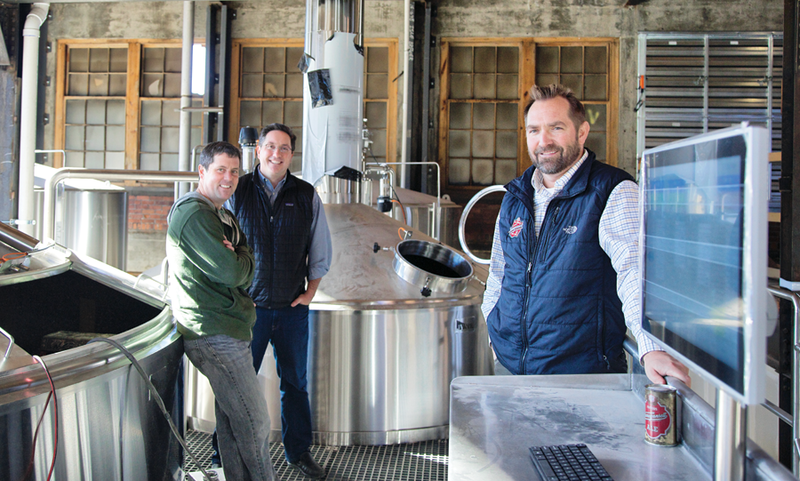 The production team, featuring hires from Harpoon, Boston Beer Works and Stony Creek, is led by Jack Streich, vice president of brewing operations, who helmed the tanks at Commonwealth Brewing Company and was a consultant for other Northeast startups. But it’s what comes out of those stainless steel tanks, produced by the industry veterans, that will be the main attraction at the Guild, whose taps will be dedicated to the brews made in-house. But before we get to the happy ending, let’s go back to the beginning of the tale. On December 29, 1890, the Narragansett Brewing Company opened for business in Cranston (on what is now Route 10 in the area stretching from Texas Roadhouse to the Cranston Police Department). The brewery, founded by six German-Americans, had the distinction of specializing in the production of lager rather than the darker ales that were common at the time (’Gansett added ales in 1898). Drinkers embraced the smoother drinking style and by 1914, it was the biggest brewery in New England. It eked out the years of Prohibition thanks to its ice-making plant and the production of near-beer. After the eighteenth amendment was repealed in 1933, the Haffenreffer family bought ’Gansett and began a series of expansions and acquisitions of nearby breweries. The brand’s profile was powered by savvy marketing, featuring illustrations of Chief ’Gansett by Theodor Geisel, aka Dr. Seuss, and animated TV ads voiced by Mike Nichols and Elaine May; the brew was the primary sponsor of Boston Red Sox broadcasts and its “Hi, Neighbor, have a ’Gansett!” tagline, immortalized by play-by-play man Curt Gowdy, captured its easygoing essence. From the mid-’50s to the late ’60s, ’Gansett accounted for about 65 percent of beer sales in New England. At its peak in the mid-’60s, ’Gansett employed more than 850 workers, including salesman — and future Rhode Island governor — J. Joseph Garrahy. By all accounts, the brewery was a workers’ paradise, with a unique and enviable fringe benefit: employees could drink the fruits — or, the hops, malt, yeast and water — of their labor on the job. The bubblers (a.k.a. water fountains) actually had beer flowing from them. The Cranston plant closed in 1981 and production of ’Gansett was moved to a Falstaff factory in Fort Wayne, Indiana; it reopened for a few months in 1983, but finally succumbed to a demolition crew on October 27, 1998. For two decades, the brand was further tarnished as it got passed along and watered-down by a series of corporate caretakers. But “New England’s beer” was resurrected when the rights to ’Gansett were acquired in 2005 by a group of Rhode Island investors led by Mark Hellendrung. He had been president at Nantucket Nectars when it was sold to Cadbury Schweppes in 2002 and was working as a consultant at Magic Hat Brewery in Vermont. A chance encounter inspired his dream to bring ’Gansett back to Rhode Island. Hellendrung’s experience in the beverage industry — and his passion for his mission — helped seal the deal to return Narragansett Beer to Rhode Island. He called on brewmaster Anderson to recreate the lager’s original recipe, though the hop presence and alcohol content were elevated a bit in its new iteration. “We had conversations about ‘we’ll get the old guys and we’ll have to work our asses off for the younger guys,’ ” Hellendrung says, echoing McNaboe’s observations. He became ’Gansett’s tireless ambassador, steadily adding retail and tavern accounts and winning over a new generation of beer drinkers by emphasizing the brand’s heritage and unpretentious appeal. A fresh wave of cheeky marketing upped the fun factor. In 2010, ’Gansett declared itself “The Official Beer of the Clam.” Each summer since 2012, the lager has been packaged in retro ’70s cans and fans are encouraged to “Crush It Like Quint,” a homage to the scene in Jaws featuring the salty shark hunter (played by Robert Shaw) chugging and crushing a can of ’Gansett. The strategy worked: a 2015 story in the Washington Post declared, “After 125 years, hipsters have deemed this brewery’s beers cool.” And the company has generated widespread buzz and sales with its mashup collaborations with iconic Rhode Island brands, including Autocrat (a coffee milk stout), Del’s Lemonade (lemon and black cherry shandys), and Allie’s Donuts (double chocolate porter), plus a collective of offbeat beers in the H.P. Lovecraft series, which was launched to honor the 125th birthday shared by the brewery and the legendary Providence horror author. Hellendrung’s determination to establish a production brewery in Rhode Island became an arduous journey. In 2009, ’Gansett launched the “Drink Your Part” campaign: “Every case you buy is another brick in the brewery,” he said. Numerous sites were considered: the CJ Fox and Capitol Records buildings in Providence, half-a-dozen locations in Pawtucket, the American Tourister factory in Warren, naval properties and Fort Adams in Newport. But all were rejected for sundry reasons. Hellendrung signed on as the first partner at Isle Brewers Guild, though the deal hadn’t been announced yet when the 2015 fire destroyed the planned future home of the facility. It was a gutting — but quickly overcome — final setback. Despite the travails, Hellendrung never wavered on his pledge to establish a brewhouse in Rhode Island. In the last decade, Narragansett has enjoyed steady and far-ranging growth, racking up double-digit gains yearly, and soaring from $100,000 in revenue in 2005 to $14 million in 2015, when it ranked as the thirty-eighth top-selling craft brewery and forty-fifth in overall sales on the Brewers Association’s list of top fifty beermakers. (’Gansett achieved “craft” status in 2014, when the market definition was amended to allow “traditional” adjunct ingredients like corn and rice in addition to malt, yeast and hops). It’s now available throughout New England and in many East Coast states, plus Portland, Oregon, and even the United Kingdom. Since its return, ’Gansett’s beers have been contract-brewed at North American Breweries in Rochester, New York (a few limited-edition craft batches were made at Trinity Brewhouse in Providence and Cottrell Brewing Co. in Pawcatuck, Connecticut). The flagship Lager and Light — which account for 80 percent of annual sales — will continue to be made in New York for the time being, since the volume of those suds exceeds IBG’s production limits, but ‘Gansett’s long-term goal is to produce them in Pawtucket too. The 100-barrel, four-vessel brewing system. The first Narragansett Beer to be brewed at the Isle Brewers Guild will be a new year-round IPA called It’s About Time; the tentative release date is March 6. The label features an image of the Shepard department store clock; the words “Since 1890” are on its face and the hands read 4:59, a minute away from the traditional quitting-time/drinking-time. Later this year at the IBG, ’Gansett will bring back many of the craft beers that were the brainchild of Sean Larkin, the brewmaster and co-founder at Revival (and longtime beermaker at Trinity Brewhouse), including Bohemian Pilsner, Fest, Porter and other seasonal styles, plus some of the Lovecraft entries. Hellendrung was finally able to savor the near achievement of his goals — and decade-deferred dream — when the gleaming brewing equipment finally arrived at the IBG. ’Gansett fans drank their part. Each case of beer became a symbolic brick in the brewery’s foundation in Pawtucket. The new beers are fermenting and Rhode Islanders are eager to taste the results.